Do you plan on starting a new, at-home painting project? If so, you may be wondering how to replicate the same results that professional painters achieve. If you want to paint clean, straight lines with little to no residual paint in unwanted areas, you should consider utilizing painter’s tape on your next painting project. With enough practice, you’ll be able to consistently paint clean, straight lines without worry. If you’ve used painter’s tape before only to see lackluster results, crooked paint lines, or areas missing paint altogether, we’re here to help alleviate your frustrations. Steve Holloway Painting has provided professional painting services to Bakersfield, California and its surrounding areas for over 35 years. As industry professionals, our goal is to leave our customers smiling and satisfied with their newly painted house or commercial building. We’ve made this easy-to-follow painter’s tape guide so that your next DIY paint job is both smooth and efficient. Before you begin applying your painter’s tape, ensure that the surface is both clean and dry. Surfaces that are dirty or dusty can reduce the painter’s tape adhesive properties, making application a headache. Instead of trying to apply your painter’s in one long strip, try breaking off 2-3 feet portions of tape. This will help you create a straighter guide for when it comes time to paint. When you begin to apply your painter’s tape it is important to take your time, as a slight error could cause major problems after you’ve painted. Press firmly down on the painter’s tape to create a tight seal. If possible, use a flat tool, such as a putty knife, to help create a consistent and air bubble free seal. Begin carefully painting your desired surface, ensuring that you do not pass your brush over the entirety of the painter’s tape. Continue to paint your surface until you’ve covered the entire area. 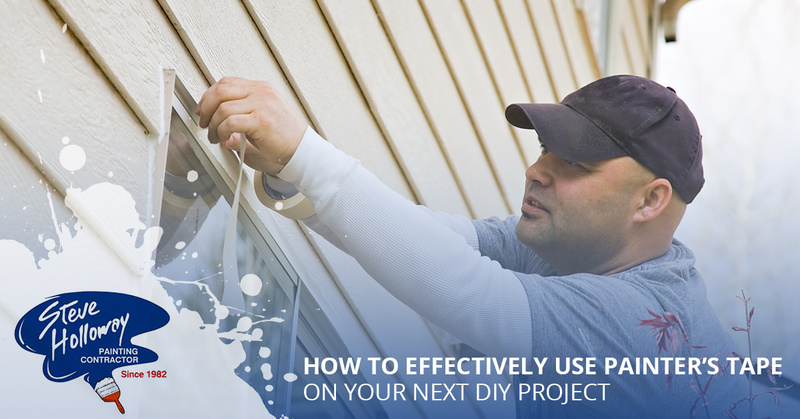 Let your paint dry overnight before removing your painter’s tape. If you remove your tape too soon, you’ll be left with jagged and chipped lines, resulting in a less than ideal outcome. When you’re ready to remove your tape, pull the tape away from the wall you painted so that you are left with clean, straight lines. If you follow the simple techniques above while using painter’s tape, you will be left with a professional looking paint job that will continue to impress you. After using painter’s tape correctly, you will begin to find yourself using it on many, if not all, painting projects around your house. When you’re in need of highly qualified and professional painters, choose Steve Holloway Painting. We continue to provide professional commercial and residential painting services to Bakersfield and nearby areas, and our affordable estimates are available to our customers free of charge. Contact us today to learn more about our full offering of services or to receive your free quote on your next painting project.